Subtropics kicked off last night with concerts by two masters. 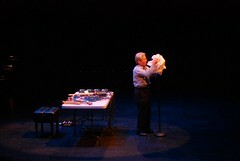 Takehisa Kosugi went first, opening with a piece that used his own breath as a sound source. Two tubes with attached transducers fed into a tangled web of signal processors, including guitar pedals, a motion sensor, and several custom built boxes (here is the rig). The sound was distorted and pitch shifted, mostly loosing its connection to human breathing — and, occasionally, hints of singing — but retaining its organic musical quality. Probably most surprising about this piece was how naturally it moved from delicate quiet moments to dense, swirling rushes of sound. 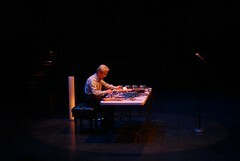 Many of the effects in that first piece were simple distortion and delay, but Kosugi put to rest the impression that his electronics arsenal was primitive with his second, all electronics-based piece. Nice, but it lacked the visceral impact of the breathing music. 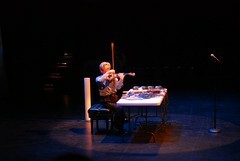 Then he moved to an extended piece for the violin, which fed into a multi-pitched ring modulator. That all would have been enough, but Kosugi had one more trick up his sleeve. He dramatically unrolled a large piece of paper that had stood behind him throughout the performance and walked to a previously unused floor microphone. He caressed the mic with the paper, then slowly and deliberately crumpled the sheet into a ball around it (this all sounded exactly like you’d think, except much lower in pitch (perhaps because the paper was unusually thin?)). Then proceeded a long solo performance by the paper ball, producing an unlikely symphony of low-pitched thuds and pops as the crumples settled themselves. During this Kosugi sat at his table, still and contemplative, while the light gradually crossfaded from his table to the microphone. When the paper was finished, so was the concert. Spectacular. Takehisa Kosugi’s performance was all body, instinct, and drama, and Christian Wolff is in some ways the the polar opposite, his manner much more casual and his music much more cerebral. He opened with a perfect little piece for prepared piano, all quirky phrases with lots of space in between. 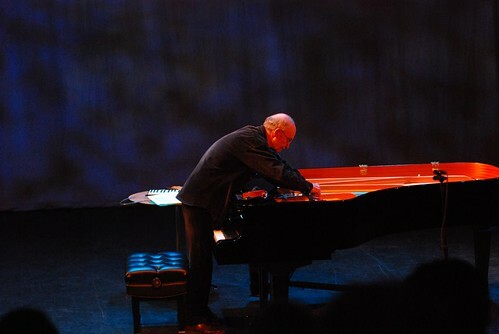 The photo above is of him “un-preparing” the piano afterwards (incompletely as it turned out — in the second half of his set he suddenly stopped in the middle of a piece, bent over the piano, and found one last little object he’d missed before!). 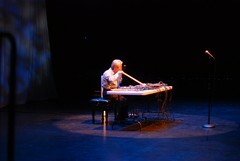 He played a collection of short pieces for the piano, with a little set of melodica pieces in the middle. Wolff’s music is at its best when it’s at its most angular, so it works great on the piano. All of his music has an internal logic, but it takes lots of concentration to get into that logic for each piece. When the listener’s concentration fails, the music can come across as meandering, and it’s open to debate whether the composer should share in the blame for this. As is the case with this sort of music, there was no big finale — Wolff simply announced he was about to perform his last piece, and proceeded, with whatever the antithesis of bombast is, to delicately tear the roof off the place. A killer start to Subtropics, which goes almost every day until March 4th. Bring your ears. A note about the photos: I’m trying to minimize the annoyance to my fellow audience members with my clacking shutter. Kosugi’s performance had plenty of loud moments where I could safely snap away, but it simply wasn’t worth disturbing Wolff’s piano pieces. Plus, the piano manipulation is the better image anyway (though I wish I’d framed it better). A note on your note: At the Merce Cunningham performance tonight someone about two rows behind me was “clacking” away with some camera that sounded like a 1920 Underwood typewriter. It was the first time I’ve considered violence against a photographer. After a few minutes there was a virtual exodus of people leaving the theater to get an usher.